The other day AT&T pushed out the Windows Phone 8862 update for the Nokia Lumia 900 and now they are giving the Samsung Focus 2 and the Dell Venue Pro little attention with Windows Phone 7.8 updates as well. The update process for the Samsung Focus 2 is rather lengthy and includes four updates that ultimately brings the Focus 2 to the 8862 OS version. It also includes one Samsung firmware update. The whole process takes about forty minutes and in the end, the update gives the Focus 2 multiple Live Tile sizes, more theme color choices, and lockscreen support for rotating Bing wallpapers. 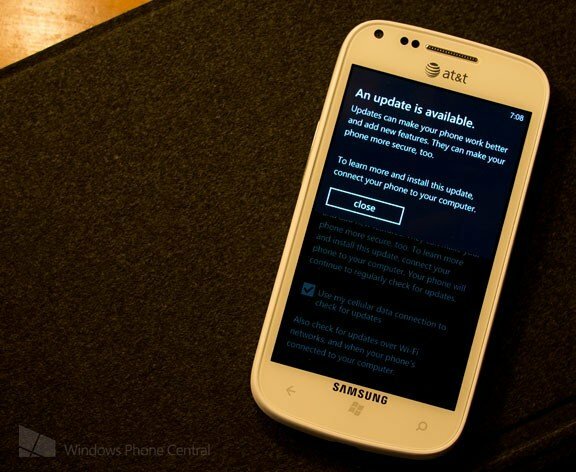 Oddly, the Samsung support page for the Focus 2 dates the release of the Windows Phone 7.8 update on January 23, 2013. Either the update flew well below everyone's radar or it took AT&T a while to certify things. As far as the Dell Venue Pro is concerned, AT&T surprised a lot of people by updating it to Windows Phone 7.8 back in February. Today, the Venue Pro gets updated with the 8862 update for Windows Phone. The process includes two updates which are quickly installed and you won't see any firmware changes this go around. While the updates for the Samsung Focus 2 isn't that surprising, seeing the Venue Pro updated was a little odd giving the age of the device. Nonetheless, it's nice to see AT&T give these older Windows Phones some attention. Maybe the HTC Titan lineup will be next. Thanks, Gurggles and sla83456, for the tip!